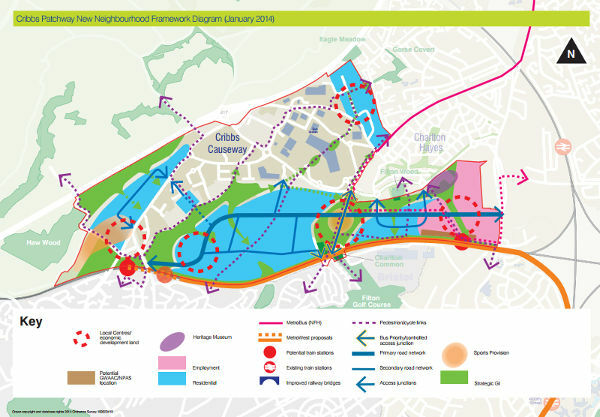 The Core Strategy at Policy CS26 identifies land in the Cribbs-Patchway area for the development of a new neighbourhood with approximately 5,700 dwellings, around 50 hectares of employment land, open spaces, schools and community facilities. It will develop over the next 10-15 years. This will be a very major development and the council is keen to ensure that work is co-ordinated and that impacts on surrounding communities are identified and addressed. To help co-ordinate delivery of the new neighbourhood we have prepared a development framework Supplementary Planning Document (SPD) which was adopted in march 2014. We have commissioned a number of studies to help inform preparation of the SPD and where practical, documents will be published here. This includes the endorsed 2013 version of the SPD. Development land within the new neighbourhood is in several different ownerships. The joint landowners are working together to show how they consider the principles of the SPD can be taken forward. These show in broad terms how the joint landowners consider the SPD requirements can be met. Note this framework plan follows from an earlier version of October 2013 and May 2014. We consulted on those proposals and while commending the landowners on their work, asked for clarification of a number of points. The joint landowners have prepared the revised draft in response. In addition to the joint overarching framework plan AN proposal, the landowners/developers are working on detailed plans for their own areas. Persimmon Homes & Ashfield Land – control land south of the former airfield and have submitted a planning application (reference number PT12/1930/O) for up to 1,100 dwellings, a local centre, primary school public open space and associated infrastructure. Deeley Freed Skanska Residential (DFSR) – control land west of the A4018. The Core Strategy has removed this land from the green belt and made it available for residential development. DFSR are developing plans for around 1,000 dwellings and supporting facilities. Details of this proposal can be viewed at www.landatcribbscauseway.co.uk. BAE Systems/ Bridgehouse Capital – BAE Systems own the former Filton airfield. Consultation on proposals for their land began in early 2014. Redrow Homes – Redrow Homes were granted permission in 2012 to alter and widen an access road at Charlton Common. An application to the Planning Inspectorate for consent for works on the common land was due to be heard at a public inquiry in November but this was cancelled. The Mall – in his draft main modifications the Core Strategy Planning Inspector removed reference to retail expansion at The Mall, suggesting that this should be subject to further analysis and should be included in future policy documents. Patchway Trading Estate – The trading estate is managed by LaSalle Investment Management. The Core Strategy indicates scope to change this area to have more residential or mixed-use and to provide better links between Patchway and the Cribbs Causeway area. There are a number of existing tenants in this area which may affect the speed of development.